In the UK, we started to provide support to Flood Re (www.floodre.co.uk), a pioneering scheme to make flood insurance more affordable for residential homeowners at risk. In recent years, floods have risen in frequency and intensity in the UK, causing unprecedented damage. Given the impact of climate change on northern European winter storms, this trend will likely continue or even increase. Many towns in the north of England have been hit by major floods in recent years. In 2016, we started to support Flood Re, a pioneering scheme set up to offer vulnerable UK homeowners more affordable flood insurance. 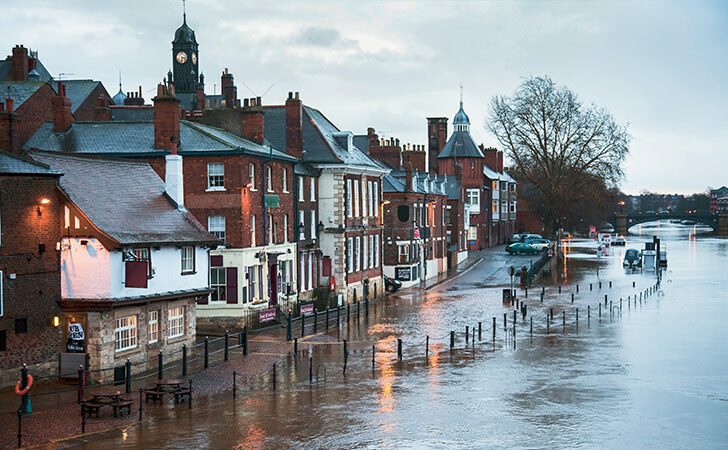 Based on a partnership between the UK government and the insurance industry, Flood Re manages a central fund that allows insurers to pass on the flood risk of individual policies. When a homeowner suffers damage from flooding and makes a valid claim, the scheme reimburses the respective insurer out of this fund. This reduces insurance premiums for flood-prone homes. Swiss Re supports the programme as a lead reinsurer. In total, Flood Re has secured GBP 2.1 billion of reinsurance cover, making it one of the five largest natural disaster schemes in the world. Ultimately, it is expected to reach some 350 000 households in the UK, providing valuable learnings for other countries at high risk of flooding.